I still can’t believe my time. I am so so exited about what I was able to run. 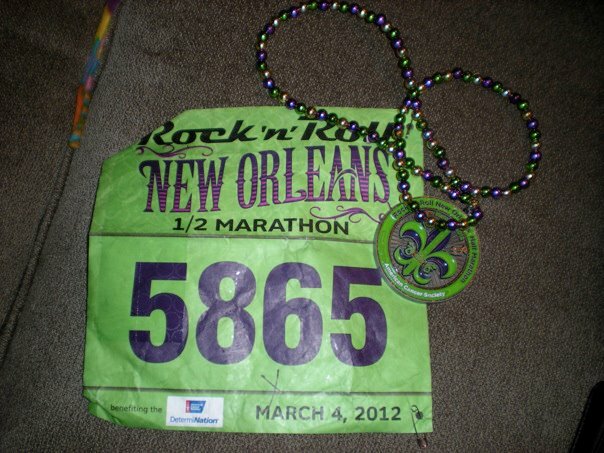 I never wrote down my goals for this race, but really they have been the same since August 2010: break 1:55. And I finally did it! Not only did I break 1:55, I crushed my previous PR by 4 minutes. My official time was 1:52:20! I ran that. Me. I held an 8:35 pace for 13.1 miles. And my body doesn’t only kind of hates me. I wouldn’t say it felt easy, but it wasn’t a struggle, which so many other races have been. Let’s take a step back to the start of our awesome trip to New Orleans. Kelsey, Maureen and I were all flying in at different times, but decided to just meet and the airport and split a cab into the city. This was all much easier said than done, but we all made it. 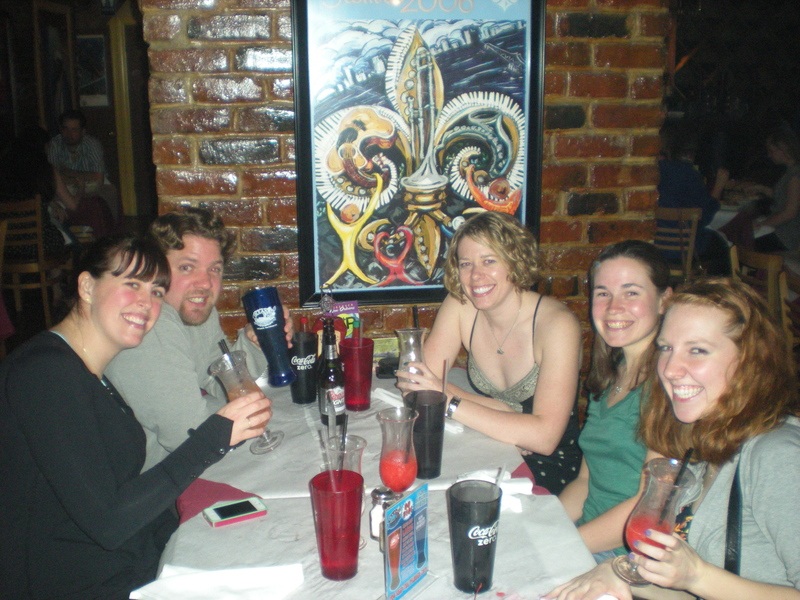 A few delays, beers, and showers later we made our way to Bourbon Street to meet up with Katie and Wyatt for dinner. Hurricanes (and Coors Light) all around! And then we explored Bourbon Street. It is as disgusting as I remembered. 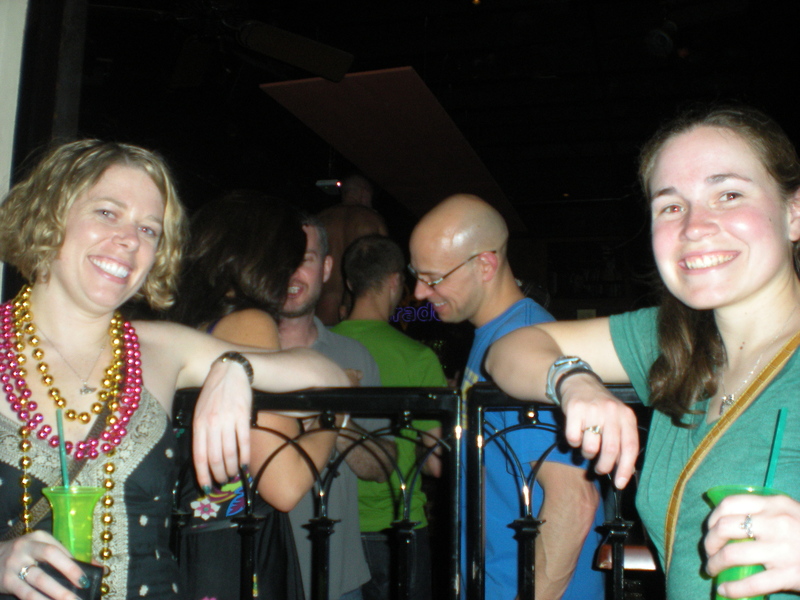 Bourbon Street Pub and Disco Show, which translate to almost naked men dancing on the bar. We refused to pay the cover so were on the outside of the "fence". We decided to hit the expo early on Saturday to avoid all out craziness. We ended up getting there around 10:00, which wasn’t bad. Bib pick-up was easy. I bought a hat and some bondi-bands for Sara. Nothing too exciting and we escaped before it got crazy. Post expo we went and had Beignets, which were awesome. I mean, it’s fried dough with powdered sugar. How would that not be amazing? This was followed by Lunch at the Ruby Slipper. We met up with some lovely twitter friends for dinner. It was lots of run to meet and see people again. The restaurant was clearly not prepared for a marathon to be in town. We actually thought our waiter left when we were trying to pay. Also, my chicken pesto pizza had no pesto. At least dinner was fun. The race started at 7:00am so it was an early wake-up, but with three of us in the room there was no concern that we wouldn’t all be up and moving around. Thankfully our hotel was in an awesome location and the walk to the start was super easy. Photo, bag check, chit-chat, and then we wandered to our respective corals. It was a little chilly, but we are all midwestern girls so it was nothing compared to the winter weather we had been training in. 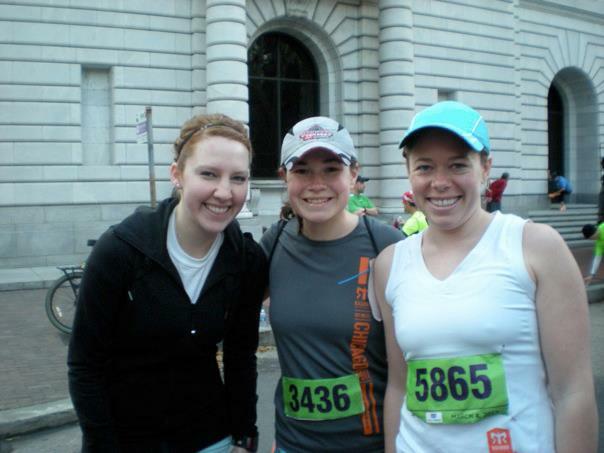 Kelsey, Maureen and Me all ready to go! My plan was to go out easy and build up. Well that plan went out the window. My first mile was not slow, but it did feel easy. 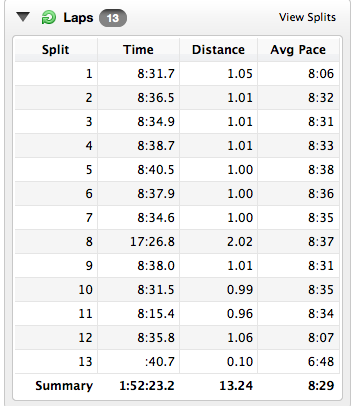 Note: I turned off auto-lap so the splits are a little funky and I missed the Mile 8 marker so have two miles on lap 8. Um, woah. Who knew I had that speed? Look at split 1. I just kept right on chugging along. I was watching my pace with concern that I might explode, but I never struggled. I just kept trucking along. I really enjoyed the course. I never got lost in my own head and I just listened to my body. I knew what I needed to run to get myself under 1:55. At about mile 7 I knew I could do it even if I didn’t keep my pace up, but I did. As each mile passed by I realized that not only was I going to break 1:55, but I was going to smash my PR. Look at that finish line pace. What?! That’s crazy. I almost didn’t believe my watch as I was coming in to the finish. And then I almost cried. What can I say? I’m emotional. That is a 4 minute PR. And 7 minutes faster than the last half I ran. Crazy! Not only did I get a killer PR, but Maureen and Kelsey did too! 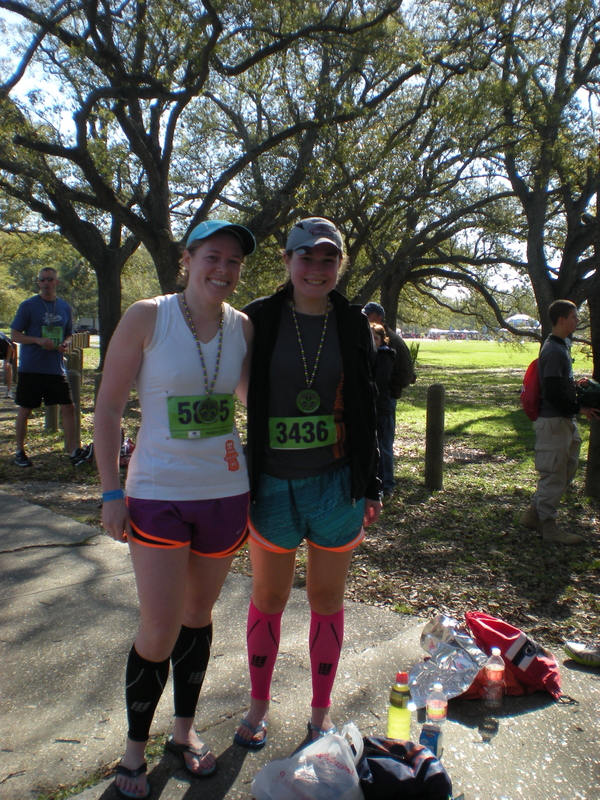 Thank you New Orleans for great weather and a flat course! And that runner’s high: I plan on riding it as long as I can. My body may hurt, but just thinking about this race makes me smile. Wooo hooo! Way to PR! You make me excited and hopeful to break 2 in the Rock N Sole! I read your tweet before the race saying something like, “Race strategy, talk to myself pretending I’m just chatting with @rushourunner ” hahahaa it made me snicker. Great strategy apparently! Thanks! I am still willing to help you get to sub 2 at rock n sole.